JSHING HISTORY thousands more than ever beforehand thousands more than any other Marine magazine in the entire world. Here is complete and unmatched coverage of your entire marine buying market...for maximum advertising results in 1985. USING RESULTS )re and better sales leads than any =s and three times more than the sted represents inquiries produced ?ITIME REPORTER in one year or less. 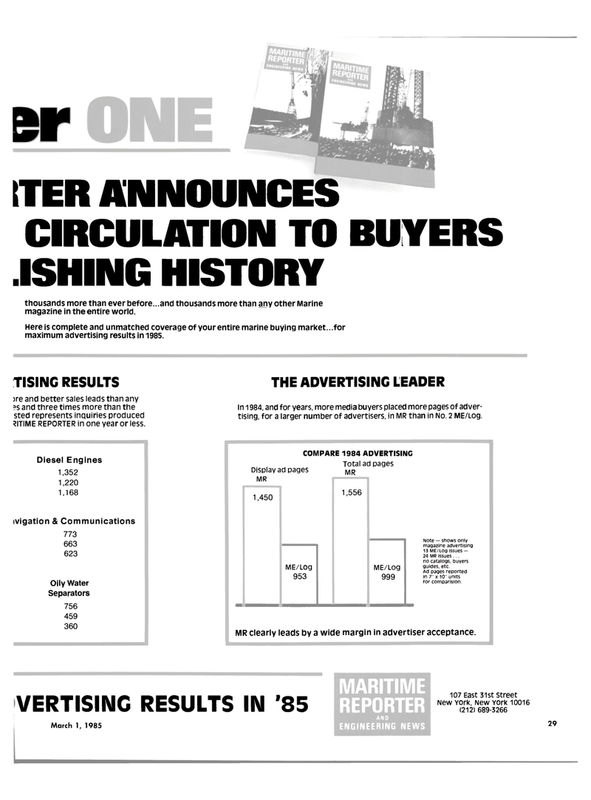 THE ADVERTISING LEADER in 1984, and for years, more media buyers placed more pages of adver- tising, for a larger number of advertisers, in MR than in No. 2 ME/Log. Note — shows only magazine advertising 13 ME/Log issues — 2a MR issues... no catalogs, buyers guides, etc. Ad pages reported in 7" x 10" units for comparision. MR clearly leads by a wide margin in advertiser acceptance.